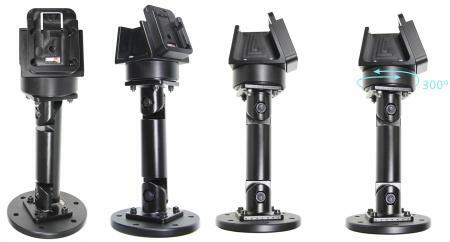 Fits for all Brodit holders with tilt swivel, perfect for a firm installation. The top part of the mount swivels 300°, fits well for use in e.g. shops with a payment terminal. Also two devices can be mounted, e.g. a rugged PDA and printer. The inclination of the mounting surfaces are 10° and 20°. The MultiMoveClip allows for easy use of different holders since you can switch in only matter of seconds. The angle of the Pedestal Mount can be changed as desired.